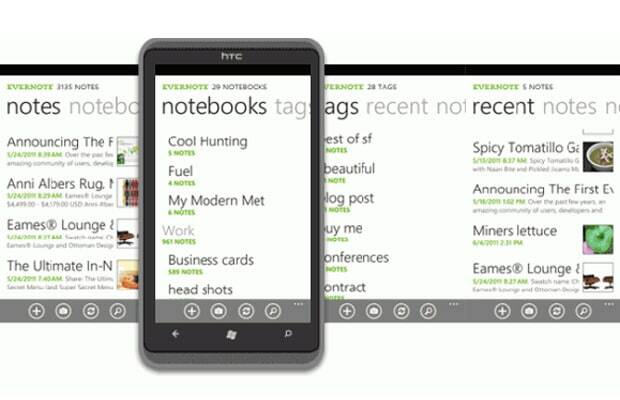 Windows Phone 7 users will finally be able to use one of the best and most popular note-taking services available today, thanks to the good folks at Evernote porting their app to Microsoft’s new mobile operating system. However, the Evernote app for WP7 is more than just a simple port. The interface has been completely revamped to take advantage of WP7’s unique panoramic UI. All the features that made the app great are still there, but for those of you rockin’ with Windows you get a Home Panorama view that displays four panels for Notes, Notebooks, Tags, and Recent Notes, making it super easy to access all your files. The Evernote app for Windows Phone 7 is available now for download.